Sarah (the one that works at the Nest at the Zoo) and I spent a couple of hours at the Zoo stream this morning. Birds were fairly scarce possibly due to a heavy sea fog overnight that provided most of their H2O requirements. The slow catch rate gave Sarah a chance to hone her skills as she hopes to get her Level 2 banding permit. She is under the tutorage of Lisa the Chief Vet at the Zoo and holds a Level 3 permit. We caught 17 birds of 6 species with 13 new and 4 recaptures. Silvereye - 5 (3) the oldest recap banded at the same site almost exactly a year ago. 1 year and 2 days to be exact. Sarah removing a Silvereye from a net's bottom shelf. Fantail - 2 (0) both juveniles. A group of us gathered at the Houghton Bay stream this afternoon. Mary, Kate, Ross, Sarah, who is part of the bird team at Te Papa and is an experienced bander joined us for the first time, and Kyle her partner also joined us before and after going away to have a loss at a football match. After a fairly slow start bird numbers increased and we ended up with a respectably tally of 57 birds of 6 species with 50 new and 7 recaps. A feature of the day was the number of children and their parents who joined us from the near-by playground for a close look at some birds. This young chap was especially enthusiastic, I doubt if the grin will come off his face for a day or 2. Greenfinch - 11 (1) the recap was banded at the Prince of Wales Park last Feb it is the first bird banded there that has been recaptured away from that site. Silvereye - 22 (5) the oldest recap was banded Nov 2011 another was banded on Mt Albert and another at the Houghton Valley School on June 12. I spent about 3 hours at the little stream over the fence from the Zoo this afternoon. Caught 43 birds - all new - and although there were 9 species the catch was dominated by finches, especially juvenile Goldfinch. Several birds especially adults are in active primary moult. This Goldfinch has moulted P1 & 2 and still retains the outer 7. Tui - 1 this Tui probably reduced the catch considerably as he aggressively chased any bird it saw. It manged to avoid the nets until it made a mistake, just before I packed up. We had a session at the Prince of Wales Park on Sunday afternoon with a reasonable flow of birds. There was a good attendance with Katherine, Roisin, Mary, Kate, Ross, Love, Gen & Nick over from Kapiti Is and Brendon, a local Vet, as well as Matu and myself. Matu spent a short time there also this afternoon until he was in the stream when the earthquake happened and he decided to pack up. Yesterday we caught 40 birds of 8 species with all but 1 being new. Today Matu caught 9 new birds of 4 species. House Sparrow - 19 the 15 on Sunday was the most caught at this site in a day, possible due to the removal of some large trees making it more suitable for this species. Eastern Rosella - 2 what appeared to be a pair and the first of this species caught at this site. Kate, Mary (our chief scribe) Love (our Swedish visitor) and I had a successful session at the Houghton Bay stream on Thursday. Despite an unfavorable forecast and a period of light rain which threatened to disrupt proceedings we had a steady flow of birds. We caught a total 63 birds of 8 species with 61 new and 7 recaptures. As with last weeks Island Bay session a large % of birds were unbanded juveniles which affects the new/recap ratio. Love was able to band several new species including a couple of "European" ones. Love with his first bird of the day, a new one "Silvereye"
Chaffinch - 3 (1) the recap was banded Nov 2010 so a reasonable old bird. Goldfinch - 7 (0) all were juveniles. House Sparrow - 19 (0) we don't usually catch a lot of H Sparrows at this site and I think this is the highest number caught in a day. Silvereye - 12 (7) 1 of the recaps was banded at Hornsey Rd and another at the Zoo. But the most interesting was banded 27 Jan 2008 a week after we started banding at this site and is now at 2181 days our oldest bird of any species banded and recaptured at this site. 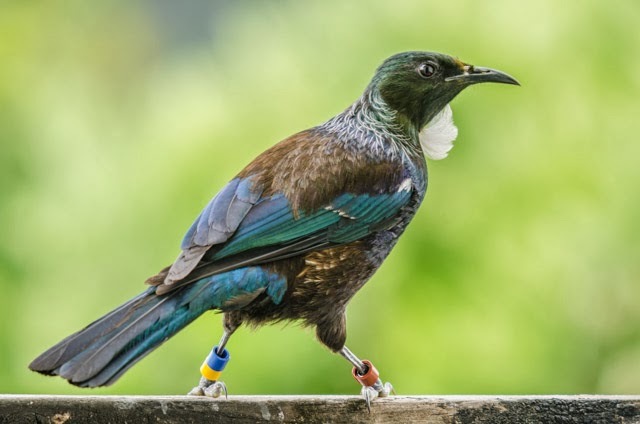 I received an e-mail with a photo attached from Tony in Northland (a northern Wellington suburb) of a colour banded Tui. The bird was easily identified even though the metal band had moved inside a coloured one. It was banded by Ralph at his place in Roseneath (before he defected to the South Island) in August 2008 so a great report to get, thanks Tony. We had a banding session at our Island Bay site this morning and with a good turnout of banders and heaps of birds we had an enjoyable morning. Most of the team. Ross (he is not actually asleep) Katherine, Ros (giving hands on training), Roisin, Kate & Otis. The catch was mainly House Sparrows and as expected at this time of year mostly juveniles. In all we caught 132 birds of 7 species with 123 new and 9 recaptures. One of the Starlings had an almost completely naked belly, not sure why? House Sparrows - 99 (8) another 5min and we would have made the ton. The oldest recap was banded Nov 2011. Although House Sparrows aren't perhaps as exciting as some other species they are a great species to gain banding experience. We had several relatively new people so they were able to gain very useful hands on training. Some of the team busy extracting birds. As is usual we enjoyed great hospitality from our hosts, Marion and Ken. Part of the morning tea after seven hungry banders had started to slow down. Love (pronounced more like Luva) who is a bander ( or ringer) from Sweden and I spent a couple of hours at the Karori Cemetery this morning. Didn't catch many birds but did have some variety with 4 birds all of different species. We haven't attempted to band there at this time of year before but thought we would try mainly to catch Bellbird that appear to be increasing in number this area. We were unsuccessful with Bellbird but did catch 1 recap Tui banded April 2011, 1 recap Blackbird (Coal Thrush in translated Swedish) banded March 2011 and 1 new House Sparrow (Grey Sparrow) plus a new Kingfisher. The Sparrow was the first bird Love has banded in NZ and the Kingfisher was not only a new species but a new genus for him as he hasn't banded any species of Kingfisher before. Love banding his first bird banded in NZ, a European House Sparrow. Although we didn't catch many birds, I enjoyed the time spent as we had a chance to talk about birds and banding, hopefully Love also found the morning worthwhile. Ralph who was a very active member of our group until he moved across the Strait a few years ago reports the sighting of one of his colour banded North Island Robin a couple of days ago. The bird which he has named Gavin appears to be the last survivor of a number of Robins he banded during a study in Pureora Forest during the 1990's. Gavin was banded in March 1997 and would now be aged as an 18, he is almost certainly the oldest known NZ Robin. It is about 6125 days since he was banded. The oldest bird that the group has banded here in Wellington is a Silvereye recaptured a mere 3817 days from banding, 2308 less than Gavin. With the skies clearing after this mornings deluge I spent a couple of hours banding this afternoon down the road at Bridie's. Didn't catch a lot of birds but at least it is a start for the new year. Caught a grand total of 11 birds of 4 species. Chaffinch - 1 (0) unusual to catch one in a cage trap. Starling - 1 (0) I was surprised to find it had moulted its 3 inner primaries and had a moult score of 9. Although the forecast is not all that good I hope to get some more banding in later in the week. Ruth and I had a great time in Auckland over the festive season and I did manage to catch a couple of Tui. Tried the yellow kind for a change. On the North Shore where we were staying Tui (of the feathered kind) appear to have increased in number like they have in Wellington. A few years ago I would have been lucky to have seen 2 or 3 in a week, now they are frequently sighted. Spotted Doves are another species that are showing a big increase there. The big surprise of the trip was a Myna on the side of the road as we drove through Foxton, by far the furthest south I have ever seen one on SH1.